Bharatiya Janata Party President Amit Shah on Thursday said his party will ensure that the National Register of Citizens is implemented across the entire country if it forms the next government. 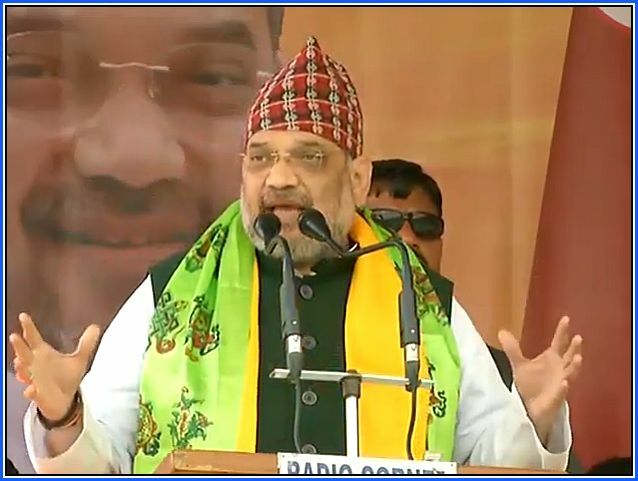 Addressing a rally in Darjeeling district in West Bengal, Shah said Chief Minister Mamata Banerjee was spreading lies about the NRC. The National Register of Citizens in Assam is a document meant to contain names of all “genuine citizens” of the state of Assam. It has been an extremely controversial matter, with many saying they have been unfairly left out of the citizenship lists, while the BJP has touted the move as strong action against “infiltrators”. The BJP’s manifesto proposes to “implement the NRC in a phased manner in other parts of the country”. Amit Shah took on Banerjee, claiming that she and the Congress party were mourning the action taken on terrorist hotbeds by the Indian armed forces. “It’s due to their vote bank politics that they did not support [Narendra] Modi government’s action against Pakistan,” he said. Shah said the BJP in its poll manifesto had promised to grant tribal status to the Gorkha communities. “The bravery of the Gorkhas, the tea from Darjeeling, their culture and the natural beauty here attracts tourists from all over the world. But Mamata Banerjee has destroyed the valleys,” he said. Shah also reiterated his party’s promise to remove Article 370 from the Constitution after BJP forms government at the Centre. The Article 370 grants special status to Jammu and Kashmir. The Darjeeling Lok Sabha constituency goes to polls on April 18. The BJP has fielded Raju Singh Bisht from the seat.